Wolf Home Inspection is a locally owned and operated residential home inspection company. We serve a multitude of clients including buyers, sellers and home owners in Madison, Dane County, and surrounding areas. 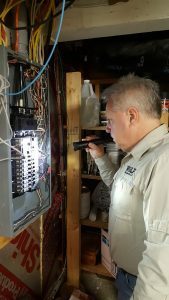 Lenny Wilkosz, owner and exclusive inspector for Wolf Home Inspection, has over 33 years of experience in all areas of construction and woodworking. The breadth and depth of knowledge he brings to the inspection process guarantees a thorough, experience-based assessment. A home inspection conducted by Wolf Home Inspection provides you with the knowledge, tools, and resources you need to make an informed decision whether buying or selling a home. The years of training and experience Lenny Wilkosz brings to Wolf Home inspection fosters the peace of mind and confidence necessary to a worry-free and smooth experience. Call (608)234-0455 right away to learn more about pricing, scheduling, and all that Wolf Home Inspection offers! Why Hire a Home Inspector?